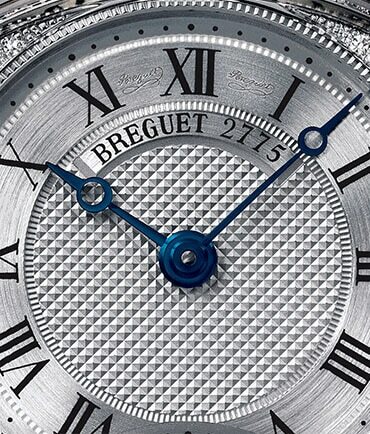 Around 1786, Breguet began fitting his watches with engine-turned silver or gold dials of his own design. 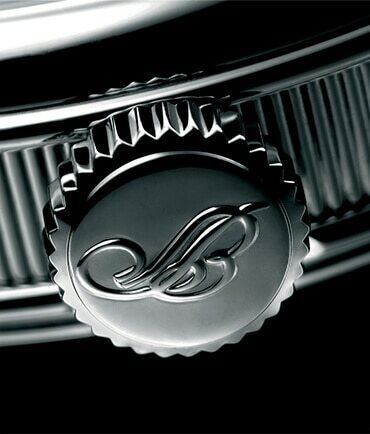 Hand-crafted engine-turned motifs are one of the unmistakable hallmarks of a Breguet watch. The brand’s famous dials are immediately recognizable and celebrated for the fineness of their patterns, reflecting the regularity of the movements within. An engine-turned dial is indisputably a true work of art. Smooth to start with, the solid gold dial plate is first worked with a hand graver to outline and hollow out the areas of the dial reserved for such indications as the power reserve, the phases of the moon, the subdial for the seconds and others, depending on the model. Engine-turning as such can now begin, resulting in a finely textured, glare proofed matt surface. Not only do the decorative patterns selected – clou de Paris hobnailing, pavé de Paris cobbling, sunburst, barleycorn, waves, cross weave, checkerboard, flame and many more – make the dial far easier to read, they also contribute greatly to its unique character. Today still, Breguet craftsmen continue to use engine-turning lathes designed and built over a century ago. With a precision of a tenth of a millimeter, they engrave intricate patterns reflecting their uncommon virtuosity. From start to finish, engine-turning depends essentially on the craftsman’s sharp eye and steady hand, of which the lathe is but an extension. Once the dial plate has been meticulously engine-turned by hand, it is silver coated using techniques developed over two centuries ago: powdered silver is delicately brushed on the plate with circular or linear movements, depending on the type of satin-like finish desired. Today, the same kind of engine-turned guilloché work engraved on gold Breguet dials is also executed on delicate and brittle plates of mother-of-pearl – a truly impressive achievement in its own right. 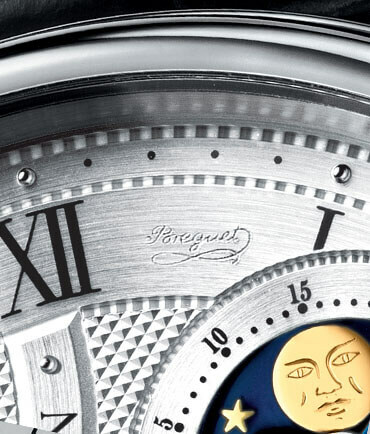 Breguet watches have featured its founder’s celebrated hollow, eccentric “moon” tip watch hands for over two centuries now. Designed around 1783, his slim, sleek hands proved an instant success and the expression “Breguet hands” soon became a common watchmaker’s term. 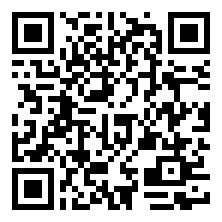 Simple and easy-to-read, they are found on most Breguet timepieces. The fluting ( fine grooves enhanced with double beading ) on the case band of Breguet’s watches is another of the discreet decorative details that constitute what has become known as the Breguet style. 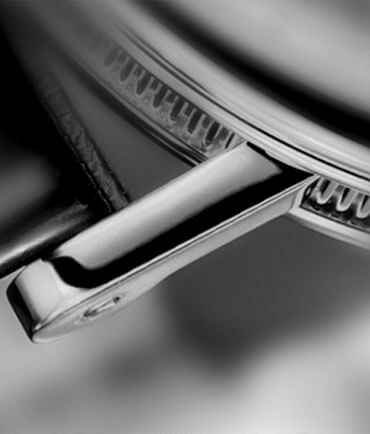 In common with many period Breguet timepieces, most of its modern wristwatches have fluted case bands - one of the features that set them apart from other watches. The fluted pattern is cold-rolled into the case band then finished by hand on a mechanical workpiece-holder. Their very success soon made Breguet’s watches a tempting target for counterfeiters. 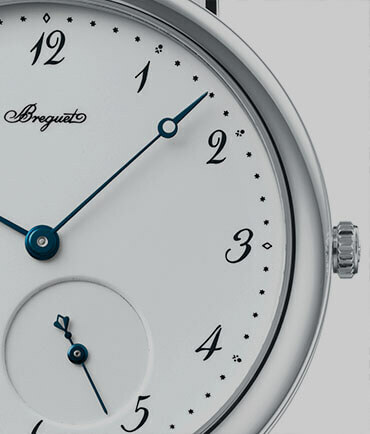 In 1795, Breguet came up with a countermeasure : the secret signature. Etched into the dial, the signature is all but invisible unless the dial is examined in oblique light. Still a token of authenticity today, the secret signature has remained a feature of most Breguet dials down to the present. 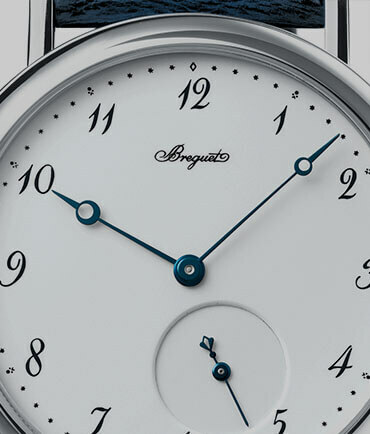 Some Breguet watches display the distinctive numerals that A.- L. Breguet designed. Although he himself was no calligraphist, Breguet’s Arabic numerals show his flair for combining function with elegance. 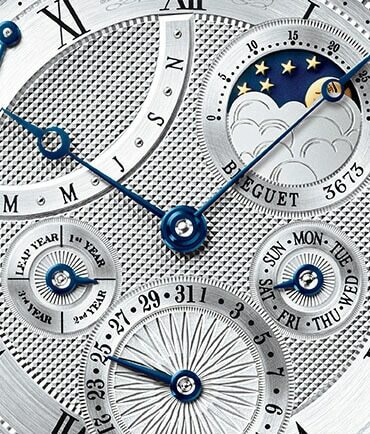 Still used today, particularly on watches with enamel dials, Breguet numerals first appeared before the French Revolution when they shared the dial with tiny stars to mark the minutes and stylised fleur-de-lys at five-minute intervals. By 1790 they had assumed their definitive form. Although essential only to wristwatches, the lugs that link the strap to the case bear all the hallmarks of authentic Breguet styling. Screw-pins, rather than the more usual sprung bars, hold the strap between the horns, a solution that is not only better looking but also more secure. The lugs have to be welded onto the case band as much for the technical reasons of rigidity and strength as for aesthetic consistency. Equally exacting is the drilling of the hole for the winding stem. Only absolute precision ensures a watertight case.